We at Hookedblog are excited to see the Orange Dot Gallery is hosting 'Coming in From the Outside' an exhibition by acclaimed New York street artist, Michael De Feo. Widely exhibited around the world, this is Michael's first solo exhibition in London and will feature for the first time, re-interpretations of his iconic flower image along with other new prints based on his drawings. The prints have been produced in small, signed and numbered editions on a variety of materials including maps and blueprint paper. Many of the editions include the addition of hand painted embellishments. 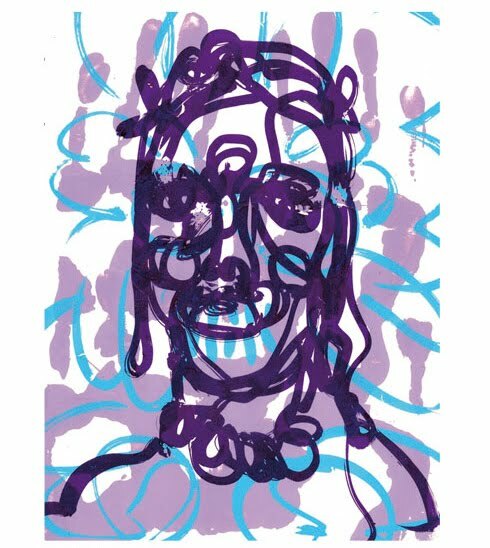 Michael's new prints are collaborations with master printmaker, Gary Lichtenstein. The pair first worked together in 2008 when the Aldrich Contemporary Art Museum invited Michael to produce an Aldrich Edition to benefit the museum. Gary is widely respected in the field and is presently working together with Robert Indiana on his HOPE series of prints and canvases. A special, signed and numbered, two color edition with hand painted embellishments entitled, 'Broken Sunshine', will be given away to the first fifty visitors of the gallery on Saturday, March 12th.